Basecoat Primer Sealer is an oil-base product that is ideal for sealing and priming porous surfaces, helping to cover and fill small flaws on the surface, and making it ready to accept the size (adhesive). It is compatible with both our oil and Water Based size, as well as with our acrylic topcoat sealer. 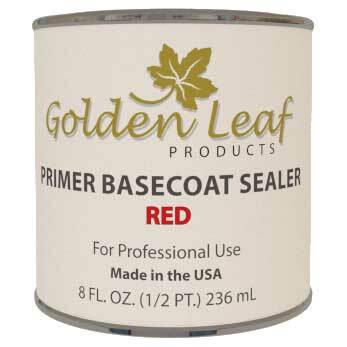 Basecoat Primer Sealer is available in three colors. The red sealer will give the gold leaf a deeper, redder, color tone. The Yellow Sealer will help cover up possible flaws in the gilding process and may lighten the color of the gold leaf a bit. The gray Sealer is usually used as the basecoat for silver, palladium and 12k gold leaf.